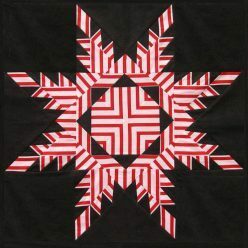 I have five entertaining and informative talks currently available, displaying plenty of real quilts, (not slides). Which way do I press it? The usual rule is “press behind the darker fabric”, but a careful choice of pressing direction – sometimes in opposition to this rule – can make a big difference to the precision of your piecing. A “teaching” talk aimed at those wanting to learn more. A “teaching” talk showing how to achieve stunning effects in blocks and borders with striped fabrics, including tips on how to make them meet perfectly in mitred corners. The story of my developing love of making traditional quilts in a modern way. A general talk aimed at a mixed audience. Learn about the history of patchwork and/or quilting in Britain, with a chance to look at many beautiful examples of quilts from my collection. I now have too many antique quilts to fit into the car, so you will need to select “patchwork only”, “quilting only” or a bit of both! I am a popular and patient teacher who gives time and attention to each person so that everyone learns and enjoys the class. Although I don’t currently teach any regularly scheduled classes, I could come to lead a one-off day or weekend workshop on a variety of machine-stitched traditional style patchwork projects and techniques with your group.